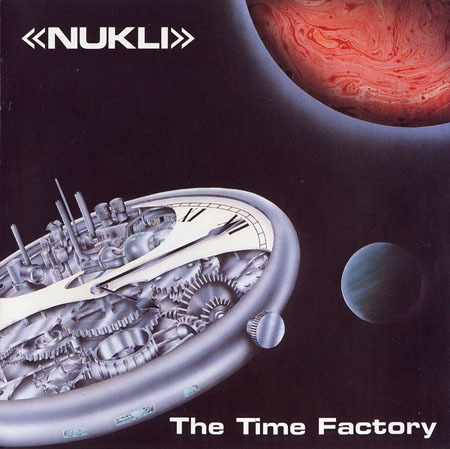 Nukli is a psych-rock band who have a fairly long history peppered with only a few, rare releases. Having spent a good part of the 80s gigging in England on the festival scene with the likes of the Ozrics, the band eventually dissolved as the keyboardist moved to Canada. Delerium has recently put out The Time Factory, which is a reissue, archival, and new release all in one. Based mostly on the unfinished (but still released) cassette Book of Changes, The Time Factory completes the music by adding in the keyboard parts and staple psychedelic TV-land one-liners and samples. The main riff on Book of Changes is one of the best passages on the album. The band keeps revisiting this theme in between funkadelic tripped-out pseudo-disco passages and the aforementioned sample montages. Vocalist Kev Hegan sounds very similar to Bill Berends (Mastermind) at best, and by the second track things are a little worse. However, the last two tracks re-done from the cassette are essentially all instrumental and include a restatement of the main theme from the first track. Here, the band is at their best, with some decent guitar work from Hegan and solid keys from the apparent band leader Eric Pavlyak. The last track digs deeper into the band's history, from the mid 80s, when some (evidently) important figure by the name of PSi Steve played with them. Propelled by dated a drum machine, this last track adds little to the album, other than a lot of time. Fans of the psych scene are sure to enjoy this release, but the slightly below-average production values, gimmicks, and vocals might not fare well for those used to Ozrics or Porcupine Tree.